Tournament of Champions - JULY 14-16 TOURNAMENT OF CHAMPIONS - WAVE TWIN RINKS - AND WAVE SPORTS CENTRE IN BURLINGTON - CHECK THE CHAMPIONSHIP TOURNAMENT FOR GAME DETAILS, SCHEDULE AND ARENA ADDRESSES. Registration is open; go to the HOME page (http://www.originalsix3on3hockey.ca/) and click JOIN A LEAGUE button. You can pay online with Credit Card but there is a service charge for credit card fees and processing fees, or there are no fees if you pay via e-transfer (preferred) to this e-mail address or by cheque to our parent company NASHA 6020 Derry Rd. #59 Milton, Ontario, L9T8L6. The only reason we are in business is for our hockey players to have fun in the off-season. We call 3 on 3 organized Pond Hockey meant to bring kids back to the days of having a rink outside. No huge structure just skating miles and miles while carrying the puck, passing and shooting in open ice...HOWEVER we want the parents and coaches to have fun as well so we have created a number of contest that are fun but also rewarding financially and that is certainly fun for parents and coaches. Hi everyone we are offering a contest for early registration. We are going to have a draw each month for one FREE registration. Everyone who registers and pays in full during January will be in the January draw. In February all January registrations will receive 2 ballots and those registering in February receive 1 ballot. In March, those who register in January get 3 ballots, February registrations 2 ballots and those in March 1 ballot. The contest will end March 31st. We look forward to an excellent season. his season every week for our 6 week regular season before the Championship Tourney you will receive a scratch ticket when your child attends the games. Attendance is very important to ensuring the quality of games and we want to reward the players/parents for showing up to play. This scratch ticket will allow you to win $25,000 by matching symbols. The total prize pool of $25,000 will be split if we have multiple winners within 2 weeks of the Championship Tournament. If a family does not scratch their ticket and report to the league a winner they will lose out in sharing the $25,000 prize but if they are the only winner they could still claim the prize. We are looking for coaches, if you would like to help our young players by coaching we would love to have you. Please e-mail us if you are interested and we will contact you. We appreciate our coaches so much we thought we would reward coaches. First with a rebate on your child's registration if bring a full team of 10 players. Secondly we are going to give our coaches who bring a full team a chance to win $100,000 at the Championship Tourney. One coach will get this chance while 9 other coaches will get a chance to win $10,000. We will be holding a putting contest to allow coaches an opportunity to win. We have changed the name of the league this year to better reflect the Original Six approach we took last season and give our players the NHL feel for their hockey. The league is owned and operated by the same people, we just have a new name. ORIGINAL SIX 3 ON 3 HOCKEY. NEW Junior Division - Yes we have expanded to include a Junior age group as we didn't like losing many of the players who aged out of our league after playing for many years. We have changed the name of the league this year to better reflect the Original Six approach we took last season and give our players the NHL feel for their hockey. 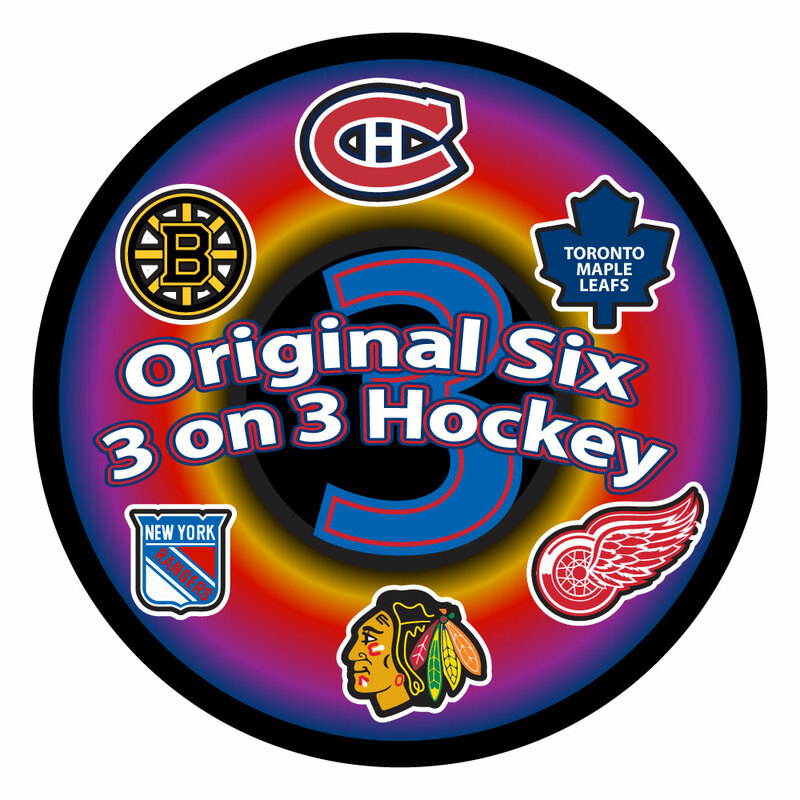 Original Six 3 on 3 Hockey (formerly Cory Conacher 3 on 3) spring/summer league runs from the end of May to July. No Holiday Weekend games. The league emphasizes fun, safe play and competitiveness to a certain level. Everybody makes the playoffs ending off with a Championship weekend. In Original Six 3 on 3 hockey, each team has three skaters and a goalie on the ice at a time, giving players considerably more time to skate and handle the puck. The unique rules, including no icings, contribute to a fast, exciting pace and this wide-open format promotes creativity amongst players of all skill levels. The full ice surfaces for games gives players the chance to develop their skating, practice their one on one stick handling and long distance passing skills. Our leagues are currently available from Novice to Junior (new this year). Players register as teams or individuals. To ensure a fun experience we do accept 'play with' requests. Every effort is made to accommodate the players. New this year is a Junior Division, for players who would like to continue their hockey experience with coming in and playing a quick game of Original Six 3 on 3 each week. (No practices etc.) The Junior Division will be open to players born in 1996/1997/1998. Come see the difference Original Six 3 on 3 hockey can make in your game. You won't want to play any other way!